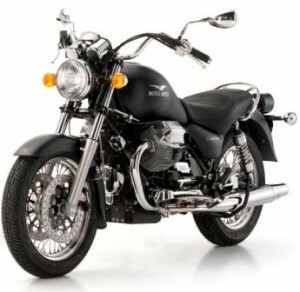 The Moto Guzzi California Black Eagle edition has been announced for the 2010 model year. 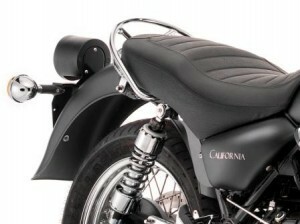 This new Cali has a matte black paint scheme, named Aquila Nera, and shares some formerly unique features of the California Vintage. The often debated retro style tail light from the Vintage now also comes on the Black Eagle edition. I do get a variety of comments about the tail light on my California Vintage. Some say it looks just like it came from an old motorcycle (as intended) and they like it, while others think it looks like it came from a hardware store to fit on a tractor or maybe a boat trailer. Personally, I believe it fits the retro style, but I do wish it had the chrome trim ring that the early Vintage model publicity photos showed. Speaking of chrome, there is plenty of it on the Black Eagle edition California. It creates a strong contrast against the Aquila Nera black paint. While most matte black motorcycles tend to have several blacked-out or muted features, this one has polished aluminum and chrome all over. Borrowing again from the Vintage, the all black seat is wide and comfortable for most, and has a tubular chrome grab bar that wraps around the rear of it. It’s actually not very functional as a passenger grab bar, but is more for style as a tamed version of what came on the older Guzzis. The 1064cc fuel injected, pushrod v-twin with a 5 speed gearbox are retained from the previous California models. This is a good thing, especially for proven reliability and durability. It’s quite nice not to have to wonder about how the engine or transmission will hold up over time. The fenders are not from the Vintage, which some folks might be happy about, and are painted in the same Aquila Nero matte finish to match the tank and side covers. There are some painted components that a have the traditional gloss black finish. This including the frame, the fork brace, fork clamps, and swingarm. The Black Eagle edition Moto Guzzi California looks ripe for a range of accessories. We’d like to see some optional side bags, a removable windshield, and a passenger backrest to be made available. Adding on a set of chrome or matching black crash bars might also help finish off the look of this new member of the Cali family. Hi Greg, congratulations on getting your California! I am sure you will love it. Glad to hear you took the MSF course, it is a great start. I also recommend reading Proficient Motorcycling. It is a wealth of safe riding strategies and advice, and is well written. No matter how long you have been riding, there is always more to learn. For crash bars, part number 30450260 crash bar kit that was on the EV and other Californias might be the way to go, but you’ll need to verify if it will fit yours or not. I think it costs about $135. Otherwise, you always could add the bars from the California Vintage, but I’d look at the EV bars first. Just bought an 2011 California Black Eagle. This is my first bike outside the realm of scooters and vespas. I did take the MSF classbut am definitely still a little nervous the size and power. I plan to go slow and ride a lot back streets, empty parking lots, and take a lot of riding courses until I feel comfortable. But I have to add I am very excited about taking for its first ride. Can any suggest where I can get some chrome crash bars? The bike can certainly handle, and your limit of grip isnt the OEM tyres either! I have a 2010 Aquila Nera, and its a great bike! Its the same bike as the Vintage really, but with the stunning metallic matte paint and no screen, luggage, etc. However, as its the same bike if you want to retro fit this, you can do so. So it might end up becoming a matte black Vintage after all! Good website and GREAT bike. Greetings from Italy (by an italian California owner).